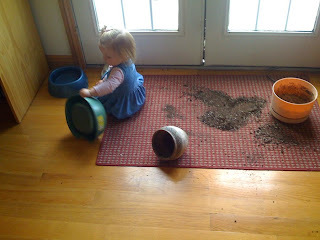 She has these most amazing pots of dirt with green things coming out of them that I help her rearrange. Mommy says I shouldn't, but Grandma just smiles . . .
Mommy said something about being too big for this, but Grandma said I was perfect. I thought it worked out just great. It's a good thing that we have grandmas! That's what Grandma's are for. 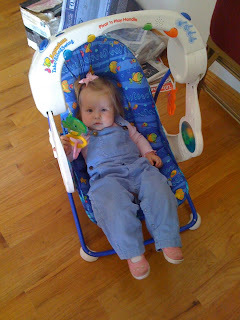 Kate sits in her old swing as well. Time really does go by fast with Kate, I can't even imagine what it will do with two. Don't worry too much about measuring big. I did that with Kate. She came a week early on the night they were going to induce me (because I was so big). So maybe they'll let you go early so he's not too big at delivery.